• Proper tool selection for the application. • Ensuring the tool’s feed rate and RPM is correct. These objectives are universal for all types of cutting tools as well as all types of cutting tool materials. Selecting the correct tool and geometry will be influenced by many factors, and it’s very important to consider all aspects of the application in order to arrive at the correct tool selection. Carbide grades continue to evolve as the producers of carbide strive to get a competitive advantage in the marketplace. Because there is such a wide variety of carbide manufacturers and products here are some basic facts to know about carbide and how it is composed. A “cemented” metal, carbide has an aggregate and a binder component. The percentage of cobalt to tungsten and the average size of the tungsten particles is what separates carbide into different grades. Typical carbide will have about 95 percent tungsten particles and 5 percent cobalt binder. Carbides with higher percentages of cobalt binder exhibit properties of being “tougher” or “softer” and have higher transverse rupture strength. Conversely, those with lower percentages of cobalt binder have lower transverse rupture strength, are considered “harder” and more brittle, and are subject to breaking/cracking with high impacts. For woodworking tools we want carbide that is both hard and tough so that it is resistant to abrasive wear and breakage, and the ultra-fine cutting edges do not chip off during normal use. 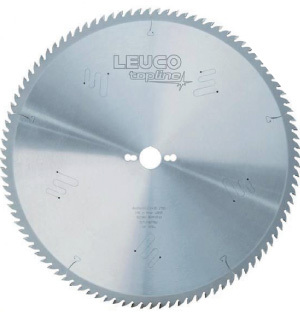 The tool should also be made using the proper grinding technique and correct geometry. Almost as important as the tool selection is making sure that it has the proper connection to the machine spindle. It is critical that the tool is located accurately, rotates through its cutting path with little to no runout and is clamped properly so there is no loss of power and no deflection from the clamping source. The most common type of tool holder is the collet style tool holder. It consists of three main parts: the tool holder body, the collet and the collet nut. Within this system, that introduces as many as five (depending on spindle taper) separate mating surfaces. While this is an economical and convenient style of tool holding, be aware that there are others systems available that are more accurate and provide up to 100 times more clamping force than the collet style, including shrink fit and hydraulic style holders. In some cases, the cutting tool and tool holder can be integrated into one unit, which solves most issues. If you do use collet style tool holders, there are basic steps to follow to get the best results possible and maintain safety. Make sure that when you change the tool that you clamp the tool holder in a proper tool changing fixture. A torque wrench should be used when tightening the collet nut; over or under tightening is bad and can be dangerous to operators. When installing the tool shank into the collet be sure at least 75 percent of the internal round portion of the collet’s I.D. is filled with full round tool shank. Resins released and superheated during the cutting process will migrate up the slots of the collet and can build up. One of the more common collet sizes is the ER40, typically used for routing. Due to the overall size of the ER40 collet and the relatively small diameter of the 3/8-inch shank, we frequently see issues of slippage or breakage with increased demand. A solution is to either switch tool holders to a smaller collet size, such as an ER32 or SYOZ25, or to a different style holder altogether. Improperly balanced tools will cause poor part finish, uneven tool wear, reduced tool life, noise and possible machine spindle failure and damage. The ISO standard for cutting tool balance is a G2.5. With today’s high speed spindles, that rating falls a bit short when getting to RPM ranges above 24,000. It is generally easiest to select an appropriate running RPM and then calculate the feed rate. Most boring tools will be run in the 3,000 to 6,000 RPM range and plunge rates of 1 to 4 meters per minute. 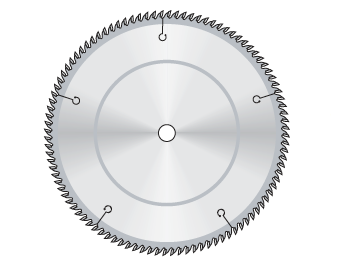 Routing tools will generally be run from 8,000 to 24,000 RPM and feed rates up to 50 meters/min. While there is no steadfast rule for selecting the exact RPM, in general smaller diameter tooling will be run at higher RPM ranges and larger diameter tooling will be run at lower ranges. Maximum surface feet, which is a function of RPM and tool diameter, should never exceed 15,000 sfm. To calculate, take the tool diameter multiplied by pi, multiplied by RPM and divide by 12. 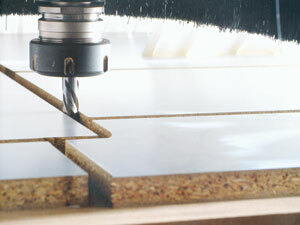 Another technique that can increase tool life for when machining panels laminated on two sides with either melamine or HPL is to oscillate the tool during the cut, thereby spreading out the wear line over a greater area and thus providing much more run time for the bit. Common line cutting is a programming technique that utilizes one pass to separate parts in a nested operation, providing a finished part from both sides of the tool as it cuts and eliminating the need to go around each part individually. With the competitiveness of the industry, it is imperative to realize the maximum benefit of every investment. This article should provide the basic knowledge to improve your routing tool’s performance and increase that bottom line. Source: Mike Serwa is the vice president of Vortex Tool Co. Inc. For information, visit VortexTool.com or call (800) 355-7708.